Pia Toscano and Stefano Langone in new “JERSEY SHORE” movie. Home → Damien Zone → Pia Toscano and Stefano Langone in new “JERSEY SHORE” movie. The singer McCullagh was talking about is none other than voted-off American Idol favorite Pia Toscano. The new Jersey Shore season will kick off with a unique concert on the beach at Seaside Heights, NJ, USA. The main attraction will be Pia Toscano who will open alone with the new theme show for the show. Also performing in the show will be Adam Lambert, Hugh Jackman, Della Reese and Paul Anka. Stefano Langone will join Pia on stage for a duet of the new song. The greatest thing about this concert is that it is really part of a major motion picture that will be directed by action film director and producer and Acadamy Award winner, Dino El Broncadez. What’s even greater is that Pia Toscano, the fabulously beautiful singer who unfairly kicked off American Idol will star in the movie. The beach concert will close with a re-singing of the new MTV theme being sung as a duet with Pia and Stefano. This will be filmed by Paramount Pictures because it will also serve as the closing credits reel for the movie, “Zombies of Seaside Heights” an action horror thriller that will star Pia Toscano, Kevin Bacon, Stefano Langone, Betty White, Ruth Buzzi and Jimmy Smits as the sheriff. 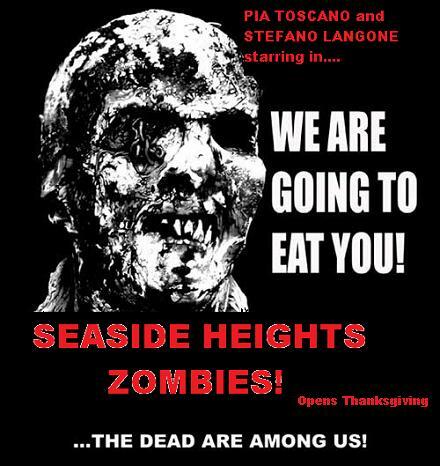 Zombies of Seaside Heights is a horror movie but not a typical teenage horror movie. The story centers around a young girl, played by Pia, who is vacationing in Seaside Heights for the summer when suddenly the Guidos and other vacationers start turning into blood-thirsty zombies. Pia’s character discovers that by walking around the small town and singing, she can vibrate the blood right out of the zombies. The catch is that there is a busload of deaf teenagers spending the summer there too and when they turn into zombies they are unable to hear Pia and therefore she can’t vibrate them to death. With all of Seaside quarantined from the rest of the world, Pia and Stefano alone have to battle the deaf zombies by using an amazing trick — but we don’t want to spoil it. The movie is planned for a Thanksgiving weekend opening. Here are the lyrics to the new song. Zombie Heights Requiem. Blood, is thicker than water – Find me, in the arcade with a quarter — Ski Ball hurts and it kills — but the lure of the beach gives you chills. Don’t try to rip into me – I’m too young for that voodoo — I’m the one, with a song in my soul — I’m the one you can turn to. Kids, on the beach with a suntan – your tattoo is so cool – and your cross is so gold – how much can I save you from ghouls. Seaside, run away with the souls – in the ocean there’s hope — there is hope for the generations – and I’m here with the vibrations — Hold me close while I sing you a Zombie Heights requiem. Extreme Coupons, Couponers and Couponing: A Serious Mental Illness. Bon Jovi Bee Farmer has a lot of Jewelry.